Even though it has been exceptionally warm here this week, the sun goes down earlier and it is chilly in the mornings and evenings. My favorite part of Summer is taking a break on my porch which is like another room in our home this time of year. Warm Summer evening are the best with a glass of wine and my latest JDL magazine surrounded by plants, statuary, urns and chippy garden pieces. I will miss using this area once the cold weather and rain comes back. 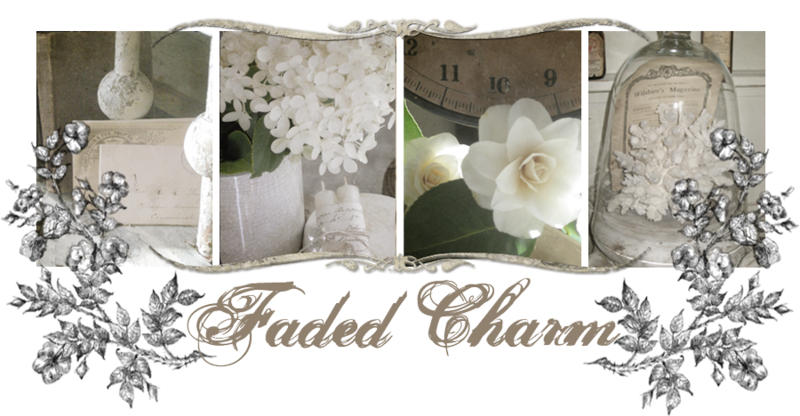 Wishing all of you a wonderful weekend and hope you are able to sit back and enjoy the rest of Summer:-) xoxo K.
Linking up with Donna over at Funky Junk for SNS and Courtney at French Country cottage for Feathered Nest Friday. This is lovely! Our enclosed courtyard is like a sauna in the middle of summer, so I am really looking forward to spending some cool days and nights out there. Yes,soon it is Autumn......but still there are a lot of flowers in the garden.. Your sweet little oasis just oozes charm! Love your autumn porch. It`s gorgeous. That birdcases are so beautiful. Wow! Breathtaking! I love your potting bench. Oh that porch looks so inviting. I love this time of year too. It is so nice to have the windows open for sleeping and I have a chaise lounge that is covered with a floral ruffle cover and I love to relax out there with my magazines too. It is so peaceful. I will miss the summer but love the cooler nights and mornings too. Beautiful pictures. so true, warm here but shorter days! love your corner of post, birdhouse and stone planer, perfectly inviting. Boy, Kathleen, you have such great pieces to work with. Your porch is perfectly cozy and pretty. Enjoy! SO lovely!! May I bring cake to have with our iced tea??? Your porch should be in a magazine...has it been in one? Lots of pinning to my boards from this lovely post, linking right back here! Your vignettes are always so beautiful, Kathleen! Your porch looks like the perfect space to kick back and enjoy the cool summer evenings, too. :) It was reeeeally cool here today - definitely autumnal!! It actually felt pretty good to have those crisp breezes flowing the open windows and making their way through the house. Such a nice change! Makes cleaning the house enjoyable! lol! Your porch is so inviting. What a great extension of the house. Oh my Kathleen...it all looks so very charming!!! Would love to have you come by and enter my current GIVEAWAY…it’s a goodie!!! Visiting your blog is like turning the pages of JDL. Your decorating is superb! You have a wonderful porch and very inspiring. What a lovely place to spend quiet time in the morning and evenings! Lovely spot to sit and enjoy the cooler temperatures. Love the charming pieces you have so beautifully displayed! I could definitely come over and hang out on your Beautiful Porch, you have it so very Inviting and like an extension of your Garden, Love it! Hi there, thank you for letting me enjoy your porch. I love porches too, I lost my wonderful front porch and my deck off my kitchen when we sold our house in August. 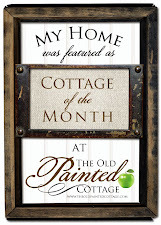 I'm just about ready to begin showing my new "Autum Cottage". You continue to inspire me. I love your porch! It has the perfect amount of chippy and white. This was the first thing I fell in love with when I met you (or your blog) Kathleen. I love this space and would find it hard not to eat breakfast, lunch and dinner out there : )and then a long nap twice a day! Well your lawn may be browning but your porch is still awesome! We don't get rainfall to speak of here in my part of Idaho. We do sometime have very wet Springs, but we rely on the snow-pack over winter to fill the reservoirs to water our properties. Thankfully, we had enough snow the past several winters to fill them. That is the only reason my grass is still green, because I don't know when we have had a hotter Summer. Has it been hotter than usual for you in your part of Oregon? I hope your week is filled with lovely Fall days Kathleen. LOVE your porch with you beautiful planters and statues! I'd L*O*V*E to come and sit on YOUR PORCH!*!*! I want to come "knock on your door!" Very inviting! I love all of your pretty things! I really like the statues and that white-rusty birdcage. It's so pretty with an unusual shape, love, love! Thanks for sharing your porch. I really like your use of birdhouses and old pieces. I enjoy building church birdhouses and am looking for ways to photograph them for business. Your use of pedestals, posts, columns as bases are helpful to me. Your porch looks very comfortable.